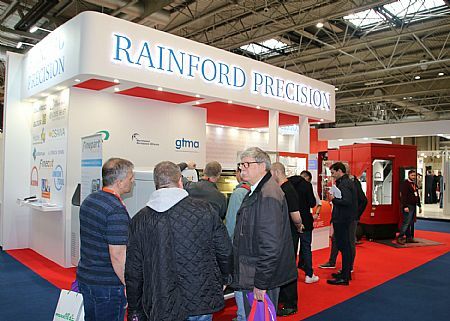 Rainford Precision has long been recognised as the ‘go-to’ company for all your micro machining applications, but applying this rationale at MACH yielded the company’s best results ever at the biennial event. According to Managing Director, Mr Arthur Turner the huge flow of visitors to the Rainford stand was credit to having ‘something substantial to show’ MACH visitors. In essence, the figurehead of the St Helens’ company was referring to the first MACH appearance of the KERN Micro Pro machining centre, the Finecut micro abrasive waterjet cutting machine and the Finespin® polishing and deburring machines that were all complemented by an extensive cutting tool portfolio. “We received a huge number of enquiries and that was because we gave MACH visitors something completely new and unique to see. People genuinely made the effort to attend MACH just to see the KERN, the Finecut and the Finespin machines. Attendees were even bringing fliers distributed prior to the show via the trade press; such was their appetite for our technology. Of course, once visitors had seen the micro technology they came for; we used the opportunity to introduce the Iwata Tool, Union Tool, Osawa, Hobe, Louis Belet, Delmeco, Gloor and Xactform ranges of cutting tools for hard machining and micro machining applications. This strategy gave end-users a chance to investigate all our product lines. It also gave us greater market penetration with all our product lines generating enquiries from all around the UK with a complete spectrum of industry sectors showing intent to purchase”. The ultra-precise KERN machine tool brand took centre stage with the innovative tool and workpiece magazine configuration integrated into the compact machine footprint of less than 4 square metres. On display was a 90 station HSK40 tool magazine combined with a 30 station workpiece changer that can carry pallets 70 x 70 mm with workpieces up to 150 mm tall. Whilst KERN takes precision to a level far beyond anything that 99% of the machine tool sector can achieve, it is the high precision consistency in dimensions that MACH visitors were looking for. Also extremely popular at MACH was the Finecut micro abrasive waterjet WMC500 II machine. Incorporating a micro-fine jet of just 0.2 mm and a positional accuracy of +/-2.5 microns with a repeatability of +/-2 microns, the impressive waterjet technology continually had a crowd of people around the machine. “This machine created a lot of interest in the build-up to MACH and the combination of high-precision with an extremely small machine footprint was something that really set the imagination racing at MACH. Engineers were looking at the machine and you could really see them pondering the endless possibilities the machine offers. Additionally, the waterjet machine can be equipped with automated auto-loading facilities, Renishaw probing systems and a vision inspection camera to deliver an all-encompassing automated solution for small part processing”. 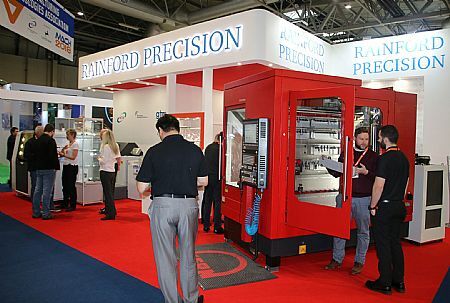 Alongside these solution driven technologies, Rainford Precision’s technical engineers highlighted the unique benefits available from the vast selection of precision milling, drilling, threading, boring and special tooling options from their suppliers, which included a watch machined from tungsten carbide with Union Tool endmills, ceramic endmills for producing high surface finishes in brass from Louis Belet, a 52hrc hard steel block drilled with 3 mm, 4 mm, 5 mm and 6 mm holes to an H7 tolerance fitted with ejector pins using Iwata Toglon drills. 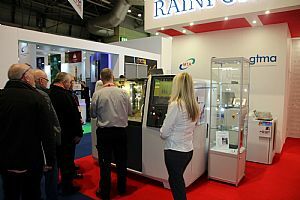 If you missed MACH and would like further details, please contact Rainford Precision – the micro machining solution provider.